The "Amélie" bedroom of a classic style with its solid wood furniture and antique oak flooring, offers over 18 m2 a clear view of the village. 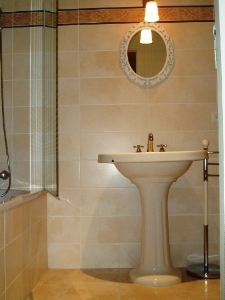 Located on the second floor, the room has a double bed, a desk and an ensuite bathroom with toilet. Ideal for two children or two adults, this extra room about 12 m2 is attached to the Amélie bedroom to form 2 en-suite rooms around a dedicated bathroom with a total area of over 30m2. This extra room has two single beds.